Stella Lansing was a middle-aged housewife from Massachusetts who in 1961 began experiencing strange, and otherworldly events that over time led her down a bizarre path of UFOs, Strange humanoid creatures, Men In Black, and visions of other worlds. Most of which she managed to capture on different types of film. Here we take a look at Stella Lansing’s work and research into a nightmare that followed her throughout her adult life. The life of Stella Lansing: Photographs from beyond. It all began in a cool September day in 1961 when Stella noticed a bright hovering orb outside her home in Northampton, Massachusetts. The object hovered at tree line level off in the distant sky before zooming closely to her, stopping in mid-air between her house and her neighbor’s garage. That terrifying incident, although short, marked the beginning of Stella’s journey. During the great Northeast Blackout of 1965, Stella was driving to deliver candles to a friend whose house had also been swallowed up by the rolling darkness that swept through the neighborhoods. En route via Flynt Street, Stella noticed a bright light overhead. She saw the same glowing object that visited her four years before. This time however, it was traveling through the telephone poles along the highway she was driving down. Her terror and confusion was temporarily hijacked by a strange dark car that seemed to suddenly appear on the highway. The black car was a few feet ahead of Stella and appeared to be “driven” by the light. The black car then rolled off the highway, down a hill to a standstill. As Stella slowly drove past it, she got a sense that the occupants of the car were looking as the bright orb suddenly dipped below the telephone wires and into a nearby field. From there, Stella saw the light fly northwest before flaring up into the dark sky. She kept her car moving until she reached the safety of her friend’s house. Two years passed and Stella continued to see strange lights in the sky that at times would follow her. Her children were no exception to the eerie events. There were incidents in which they were present when Stella saw the orbs of lights. She had mentioned her experiences only to her family and close friends by the mid to late sixties. Still unaware of what these lights were or what they wanted, she would never imagine what horrors would soon come to visit her. Scared out of her mind, Stella punched her car in reverse and pulled away from the shoreline that was uncomfortably close. 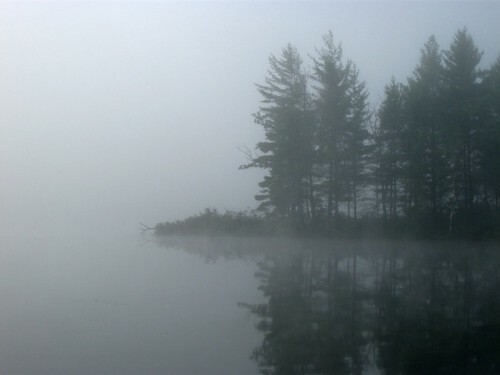 In the panic of things, she managed to see that that humanoid-looking thing had crawled its way onto shore and began running towards a peninsula that was about sixty meters away from her house. 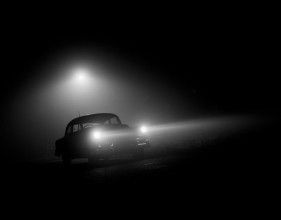 As Stella adjusted her car and headlights to shine towards the location the creature scurried off into, she saw a basketball-sized orange orb of light. Surrounding it was a fuzzy mist. The light glowed dimly and the hairs on the back of her neck stood on end. Without warning a large, brighter orb of light suddenly swooped down behind her house and then flew low across the water. The red bright object was seen by Stella’s two teenage neighbors who had seen the bright light come from the sky above and swoop down by the lake. Not far behind them was Stella’s family. They were completely oblivious to the bizarre phenomena happening just up the road. It was apparent that by 1967 — six years after her initial contact — Stella was having heavy, traumatic experiences that seemed to surround her. As the strange phenomena continued, it took a dramatic twist once Stella acquired a silent 8mm film camera. Stella had already been photographing the strange lights that haunted her, however with the 8mm film camera, she began capturing strange images that seemed to be from somewhere else in space and time. Ominous images of blurred figures and structures not seen by Stella’s naked eyes or those of many witnesses. Stella happened to once again see strange lights. It was on the night of February 18, 1967, that Stella stopped her car on Route 32, near the intersection of Warren road and Flynt street. She got out of her car to get a better look at the light. She noticed that another passenger car had pulled off the road and the driver too had gotten out due to the odd nature of lights. “They were two yellowish lights.” Stella recounted the events that night. and flew around her giving Stella enough time to carefully observed and film them. At one point she was joined by a cashier and friend of Stella who was on her way home from a long shift. The two cars were parked next to each other as the women watched in stunning wonder. Shortly thereafter the lights vanished. A blueish light then appeared off in the distance and slowly approached Stella and her friend. She kept her camera pointed steadily at the nearing object. To their relief, it stopped about 150 feet away from them before flying away. Just then a bright burst of white light blinded the two as another object also took off at incredible speeds up into the sky. All the while Stella’s camera kept rolling. It took Stella some time and effort to find a projector to show her film. At first, she had taken her film of the object she dubbed “The Red Bug” to a laboratory in Springfield, Massachusetts for developing. That’s when she learned that her 25 foot film segment had been incorrectly spliced. Out of the 50 feet of film loaded onto the camera, the last 25 feet were of her jeweler friend’s daughter and her fiancé in an outdoor setting. However the first 25 feet of film did contain Stella’s recording of the lights. It was on April of 1968 that Stella finally purchased a Bell and Howell projector of her own. A new piece of technology that allowed her to slow down the footage she shot that fateful night to two frames a second. Revealing unnerving images she had failed to see before. The bright object she filmed on that desolate road that night in 1967 contained a few frames of the heads and torsos of strangers. Strange men in what Stella believed to be a craft of some sorts. The still (Right image) depicts what Stella captured as she pointed her 8mm camera to the oncoming bright light. 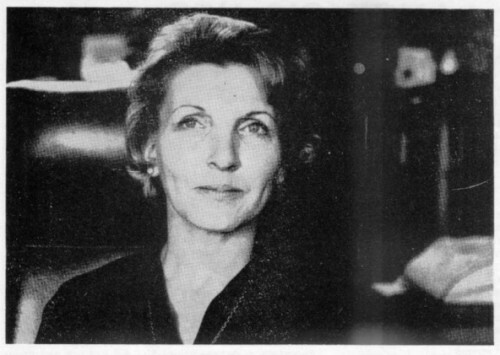 By the late 1960s, with the support of her husband and family, Stella Lansing continued her research into the phenomena that was becoming more and more mysterious and unnerving. By 1970 she had been already taking photographs that contained strange lights or structures superimposed on them. 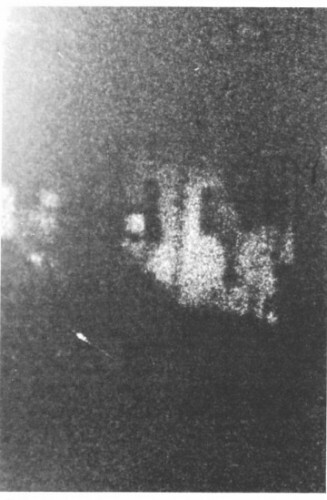 A mysterious clock-like pattern also began to appear on her films and photographs. Strangely enough, they geometric patterns appear on the film itself, overlapping the frames of the footage. However remarkable these images appear at first glance, no official investigation was done on Stella’s claims and impressive evidence. There had been no real interest until one day in 1971 when Stella walked into a UFO conference and told her story to a Dr. Berthold Eric Schwarz, M.D. When Dr. Schwarz met Stella Lansing he had already built a large following in the UFO community. 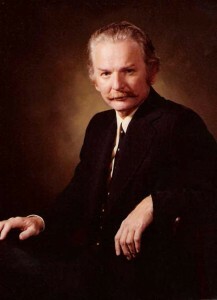 Schwarz was a psychiatrist with a keen interest in spirituality, UFology, and the paranormal. A well rounded researcher you could say. Dr. Schwarz had just finished his lecture when a friend introduced him to Stella. As she poured her story and heart out to the men in the now emptied auditorium, the doctor’s doubts began to grow. However upon hearing that Stella had brought with her evidence on film his curiosity forced him to stay longer to examine the evidence. Dr. Schwarz first examined Stella. He performed a physical examination, a neurological examination, as well as electroencephalographic (EEG) exams. Her central nervous system also checked out fine. Stella passed her examinations with flying colors. However when the psychiatric sessions began, Dr. Schwarz learned the extent of Stella’s claims of the abnormal activity that followed her. state hospital. For years the sightings of unidentified flying object and strange beings began to take a toll on Stella Lansing. She was admitted to the hospital and was under the care of the hospital’s director of Clinical Psychiatry. Under his examination, the doctor labeled Stella as a Paranoid Schizophrenic who suffered from hallucinations about seeing UFO crafts. Although not overly religious, Stella spoke of strange communications she was receiving telepathically about supposed UFO-related communications from Beelzebub, the devil himself. Stella stayed under the doctor’s care for an initial 10 days before checking herself out. However not a month later she had returned to the hospital, this time checking in for 5 weeks total. She completed treatment and was released on the basis that she had no further recurrences. It was Dr. Schwarz who believed that Stella could have gone a temporary psychosis brought on by the phenomena she was experiencing. Although Stella was Roman Catholic during her stay in the hospital, she was never described as someone overly pious. In fact, she rarely talked about religion or scriptures of any kind. This was just Stella’s mind trying to make sense of the voices, images and visitations that had plagued her for years. It was in 1971, when Stella met Dr. Schwarz, that her story moved away from the incredible to the credible. Only because the doctor himself would end up becoming one of the many witnesses to Stella’s claims. For the past decade, Stella kept meticulous records of her encounters with the strange phenomena. She kept journals of times and dates of when she saw bright lights or strange creatures. In one instance, Stella claimed that her entire left hand had suffered some type of paralytic shock when she had photographed a “Shimmering figure”. Dr. Schwarz began with the treasure trove which was Stella’s films. The spools of film which depict strange, blurry flashes of lights zooming in the sky. Or more interestingly the images of strange, out of place, structures or things. 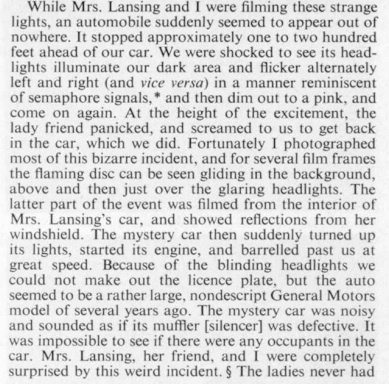 On the night of April 15, 1971, Dr. Schwarz, Stella Lansing, and a lady friend of Stella’s all drove down to a spot in Massachusetts in which Stella claimed to have a lot of encounters. The trio drove to a secluded area, killed the engine and the headlights and stepped out of their vehicle and into the silent, still night. Within minutes two yellowish glowing discs were seen up in the sky. The objects appeared to glide silently alongside each other, often times merging into themselves before splitting up again. They watched the lights uninterrupted for quite some time. As the three observed the craft, they were completely unaware of an approaching black car that had its headlights off. A classic Men In Black incident like those cataloged by the famous researcher John Keel. The incident that night lead Dr. Schwarz to believe that something unexplainable was happening to Stella and that it was in no way a cleverly done hoax since the distant UFO lights had no way of being projected onto the night sky. Dr. Schwarz even refuted claims by many that they were subjects of a mass hallucination. An explanation that is often used to explain multiple witnesses sighting the same phenomena. An impossible hypothesis since there exists no such thing as mass hallucinations. As the scientific community began hearing about Dr. Schwarz research into Stella Lansing’s phenomena the interest in her “abilities” grew. Many researchers tried to explain the bizarre photographs of crafts, lights, and the clock-like patterns infused in Stella’s film as technical glitches. That somehow light had filtered in the camera causing the anomalies. They also entertained the idea that her 8mm film had been superimposed. Something that would have been easy to do at the time. However not one of them ever managed to prove exactly how Stella captured those images. 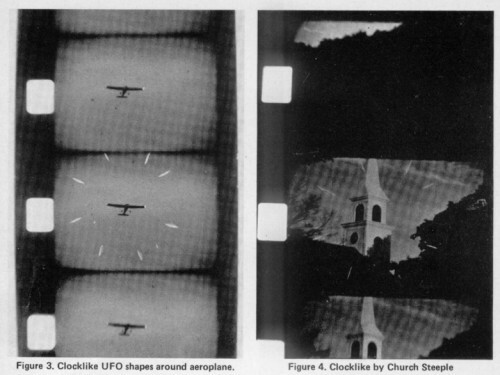 They were not able to explain how these images appeared on different types of cameras with different types of film. All showing the same patterns and ghostly images. Stella never regressed to the state of mind she was in 1967 when she checked-in to a state hospital. After the psychiatric help from Dr. Schwarz, she managed to keep her head together and continue her exploration into the strange phenomena that surrounded her. 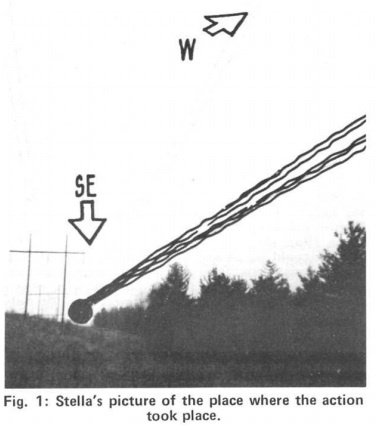 It wasn’t until 1991 that the television show Sightings got ahold of Stella and Dr. Schwarz and ran a lengthy and concise segment on the phenomena. During the show’s investigation, the exported Stella’s silent 8mm film of ‘the occupants’ onto VHS. When they did this, the investigators were shocked when they heard undistinguishable voices from the film. It was clear that the strange phenomena that had been following Stella for over three decades was partially captured on different mediums. Stella continued to jot down dates and notes every time she had an unnerving experience. A curiosity turned obsession. Stella Lansing passed away in 2012. Never knowing the truth behind her haunting phenomena. 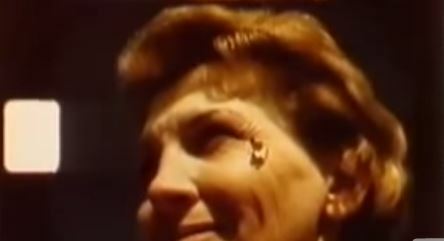 Watch the Sightings 1991 episode with Stella. 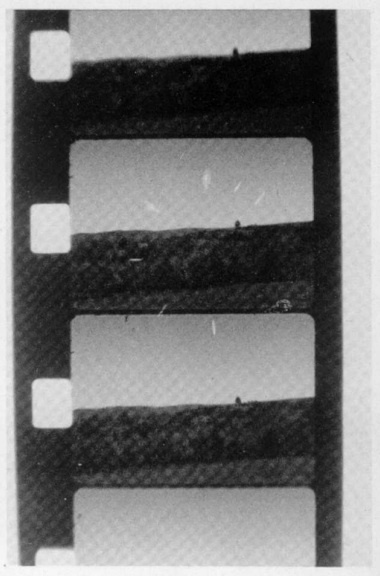 It includes Stella’s evidence of ‘the occupants’ as well as the unidentified voices heard when they transferred the silent 8mm film onto VHS for the television show. Creepy stuff happens in the Middle of Nowhere. Some intriguing statements, “… there is some kind of interaction here…I seem to know where to look … seem to know, when to look somewhere, and … there it is”. Any theory? DMT? Interesting compelling story almost devoid of actual evidence; can’t wait for the author’s first book offering. There is more information about Stella along with some of her amazing photos in Tim Beckley’s book: “UFO Repeaters”. I’ve heard several of his speeches about Alien presence in the neighbourhood. He appears to know what he’s talking about and doesn’t hold back any details. Paul Hellyer is a very knowledgeable source of information about what’s being denied to us simple folk.